The Carson of Venus series was more readable and marginally less stinky. But all of his genre work was pretty much crap, Tarzan, alas included. I tried reading the book when fairly young, and despite managing to slog through many deeply terrible novels in that era, I consistently bounced off of everything by Burroughs. OTOH, the 2012 John Carter film is immensely better and I enjoyed the hell out of it - sadly, few people saw it. The film was sabotaged by a truly inept advertising campaign. I saw one fan-made promo that explicitly pointed out all the more modern SF that was based on themes started by the novel and was immensely better than the real commercials that were put out. There's a nice bit in that film where a leaping John Carter grabs a red flag and it suddenly looks like a red-caped figure flies by. Nicely acknowledges James' point that Carter is one of the inspirations for Superman. I see Carter remembered to wear his Battle Socks. This is actually a rare cover where the artists put more clothing on the characters than the story depicts. According to the story, everyone was pretty much running around nekkid, if I recall correctly. I just found it sort of hilarious that after giving him a loincloth they had to gild the lily by giving him little booties. 1) When the word "interminable" appears in the first sentence of a review, the tone has been set. 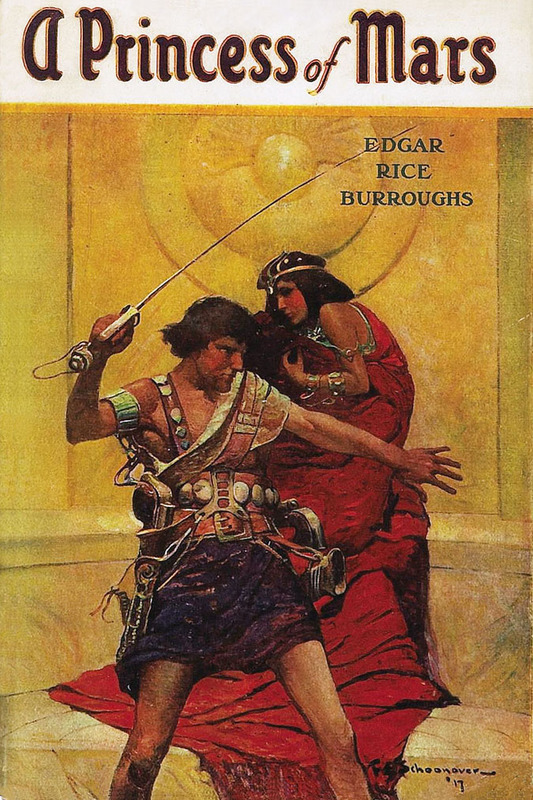 2) Looking at the original cover art, John Carter had apparently never heard of leg day. It's not just that he wasn't drawn in an overly-muscled way as later became common; those legs are so spindly as to make me dubious that he got much exercise. His arms are fine, though, which makes it look strange to me. It felt at times as though the director and writers didn't quite have the courage of their convictions. If they'd gone a lot further with the lizard fellows being responsible for the eggs etc., now that would have been fruitful. Ahem. The book John Carter though. That attitude of Burroughs was more than common among the members of his class, particularly at the time. Theodore Roosevelt was ammongthem,even though his father bought himself out of serving in the field, did serve enormously by organizing a great deal of medical matters for the army's dead and wounded, raising money for the soldiers and campaigning for Lincoln. However Teddy's mommy and grandma, who lived with them, were unreconstructed slave owners all their lives. They sent as much aid and assistance, including money, as they could to the confederate side. They hal from the Bulloch plantation in Georgia (slaves were sold to pay for the wedding!) on which some believe Margaret Mitchell based Tara. His uncles were pirates, er, self-proclaimed privateers,blockade runners, and instrumental for the so-called navy of the confederacy, involved with the confederates'infamous Alabama Affair (in which Canada was involved too).They created one of the many huge diplomatic headaches for Henry Francis Adams, son of President John Quincy Adams (famous abolitionist), and father of historian, Henry Adams, Lincoln's minister to St. James. "SF was hard to come by. Many authors benefited from my habit of reading voraciously regardless of quality." Oh, boy, they did from me at that age, too. I think it was a Piers Anthony Xanth book that finally broke that habit and got me to think, "nah, the next one is not worth trying to read, even if there's nothing else." Well, one man's trash is another man's treasure--I still love the Mars series, though the last few in the series are either fanfic or phoned in. I consider Burroughs a great storyteller, one who keeps the pace going and the reader turning the page to see what happens next. Possibly he was over-fond of the cliffhanger chapter ending/scene change, and the "science" is pure fantasy handwavium, but who cares? Nobody is reading the Mars stories for hard science fiction. As for John Carter himself, I have seen fan speculation that he's the incarnation of Mars, God of War, which explains his immortality, etc.